When I was a girl, my elementary school closed for election day because the cafeteria/gym was our local polling place. My mom would take me with her, right into the big booth with the black curtain that closed behind us. I’d watch as she flipped her choices and then heaved the big lever to cast her vote. Polite conversation or not, my parents talked politics at the dinner table. I registered to vote as soon as I turned 18. The first election I was eligible to vote in pitted incumbent Ronald Reagan against former Vice President Walter Mondale. And, I was lucky enough to be at a college where people talked about politics (a lot) and dated across party lines. During that election, my boyfriend was the president of the campus Republicans. (And, no, he did not invite me to any inaugural balls. This is still a sticking point.) The next semester, the friend who got me through political science was the son of Mr. Mondale. It was a heady time. 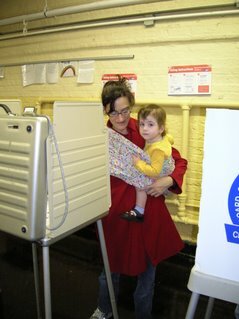 Following my mother’s example, I took my daughter to my polling place today. (Many thanks to my pal Jeanne S. who serendipitously showed up in time to take our picture.) Her memories won’t include the huge, looming mechanical machine. She’ll know about electronic polling, machines that won’t take the ballot as fed, and all kinds of Cook County mixups. 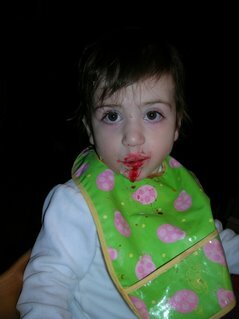 She’ll learn that sometimes we have to vote for the lesser of two evils. But, she’ll know that it is not just her privilege and her right to vote, it is her duty as the proud citizen of a democracy. Homemade strawberry sorbet. Hey, Dean, thanks for the tip on the ice cream maker!